2008 Working & Cutting Horse Production Sale: Sunday, September 14, 2008, 3 PM at the ranch. Welcome to Knippling Ranch Quarter Horses. 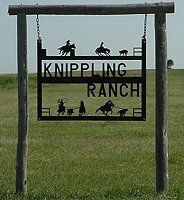 Knippling Ranch Quarter Horses offers the finest quality Quarter horses for sale and the services of Quarter horse stallions. We have an annual Working & Cutting Horse Production Sale featuring the years foal crop from our standing quarter horse stallions. We have been in the quarter horse business for over 40 years. Our brood mare band started with 4 daughters of Vanzi Bar, by Clabber Bar. We have always believed that the Vanzi Bar daughters are some of the best mamas to be had. They had excellent dispositions, good conformation and were good milking mares. In the early 70�s, we had acquired more mares than we cared to haul off to outside stallions each year, so we began the hunt for a stallion that would cross on the Vanzi Bar mares and retain all of their good qualities, plus add some of his own. While attending a sale where we were scouting out a stallion prospect, we came across Nelly Bruce, a daughter of Mr Bruce and out of Coogans Van by Billy Van. She was a beautiful chestnut with all kinds of conformation and the size we were looking for in our brood mares. To make a long story short, we purchased this mare. She had a colt at side that we sold that fall. Her name was Nell Bar and she was raced as a 2 and 3 year old and was the high point running horse in the state of South Dakota as a 2 year old. She also had a yearling stallion at the sale that was later raced in South Dakota and he won many races. At this same time, Stanley Johnson, Ree Heights, SD, had purchased Docs Jack Frost by Doc Bar and out of Chantella, a mare by War Chant. We decided to take Nelly Bruce to Docs Jack Frost in hopes of getting the stud for which we were looking. The first foal from this mating was Nelly Frost, who was everything we were hoping for in the offspring, except that she was a mare. Nelly Frost was also a race winner as a 2 and 3 year old. We returned Nelly Bruce to Docs Jack Frost and got Doc Bruce in 1973. Doc was everything we had hoped for and more. He had a great disposition, sired colts with good conformation and correct, sound legs, who had the speed to get a job done. Over the years his offspring have excelled in roping events, barrel racing, and cutting, plus being able to put in a full day of ranch duty. We sold the last crop of Doc Bruce foals in 1999. He lived a few more years before going to the big arena in the sky and is buried in a grave overlooking the creek where he spent most of his life. Nearly every one of our 60 mares is a direct daughter of Doc Bruce or a grand-daughter. In 1983, we purchased Hollys Gold Peppy, who was a 100% foundation bred quarter horse. He was a son of Peponita by Peppy San, out of Holly Dot 70, by Salty Holly, by Hollywood Gold. Although we sold almost everyone of his offspring, we do have 2 daughters in our brood mare band, by him and they are some of our best producers. When we realized the quality of colts they raised, we attempted to purchase some of his daughters back, but were unable to because the owners wouldn�t part with them. We geld nearly every stud colt before they are sold as weanlings. We feel that there is too many studs standing that are not worthy, and would rather have an awesome gelding carrying our brand than a stallion that was not of the quality we want to produce for our customers. Most years there is one outstanding colt that is left as a stallion. JK Copper Bruce and JK Doc Twin Bruce are two of these. JK Copper Bruce looks like a clone of Doc Bruce. His offspring are carrying on the �Doc� tradition by being winners in all arena events. JK Doc Twin Bruce is young yet, but has 2 of his offspring winning at barrel racing at this time. In 2003, we decided that it was time to go looking for a stud with color and bloodlines that would compliment our Doc Bruce bred mares. In the fall of 2003, we purchased Dunits Lean Dream, a grulla stallion, by Lean With Me, by Smart Little Lena, out of Redun It, by Hollywood Dun It. We wanted to add some color to our colt crop, as most of our mares were sorrels, chestnuts and bays. He has certainly done this. Out of his first crop of 35 colts, 3 were sorrel, 1 bay and 31 were either dun, red dun, palimino, buckskin or grulla. They are outstanding in quality and I don�t need to tell you what their ability will be when grown. Every magazine you pick up is full of the accomplishments of the horses in Dunits pedigree. Working cow horse events and Reined cow horse events are becoming more popular and we believe that these colts will be able to compete with the best of them. Also, with the speed breeding in our mares, there will be no question or whether these colts will be able to compete in timed arena events. Our mares run in pastures with lots of hills, so the colts have the opportunity to develop good muscling and strong bones as babies. We also start handling and halter breaking the babies around two weeks of age. They will load easily in your trailer at sale time. We take care when handling the colts so they are not afraid of humans. They learn to give to pressure when being halter trained so they are more susceptible to your training methods later. Our colts are registered with AQHA by sale time. We strive to remove as much of the risk and work of owning a weanling as we can, so you are free to enjoy and love your purchase. The brand for quality quarter horses for sale and quarter horse stallions.